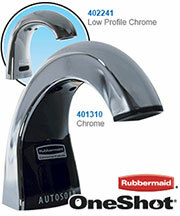 *Closet refill heads (gray) have larger slots than urinal refill heads (black). † Consult factory for availability of replacement plastic relief valves (green, black, blue, and white) and brass relief valves. NOTE: For older water closets that require 4.5 gpf (17.0 Lpf), choose kits A-1102-A or A-1038-A, but remove the flow ring before use. 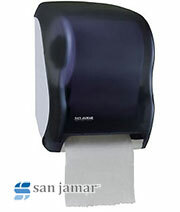 For blowout-style urinals that require 3.5 gpf (13.2 Lpf), choose kits A-1102-A or A-1038-A. For service sinks that require 6.5 gpf (24.6 Lpf), order A-36-A diaphragm repair kit (not shown Sloan Code No. 3301036) and remove the flow ring before use. 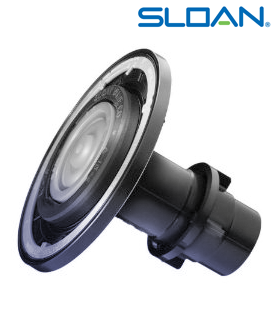 Regulations for low consumption fixtures prohibit the use of higher flush volumes. 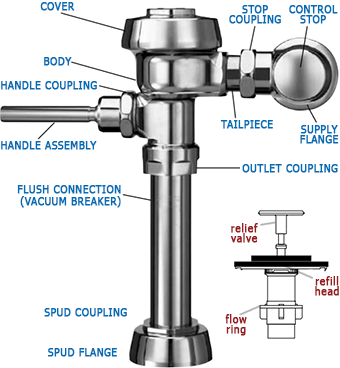 ** Water Saver (3.5 gpf closet and 1.5 gpf urinal) and Low Consumption (1.6 gpf closet and 1.0 gpf urinal) fixtures must use matching gpf (Lpf) diaphragm kits; using a smaller gpf (Lpf) kit in fixtures not intended for less volume will result in inadequate dilution in urinals and improper evacuation in closets. 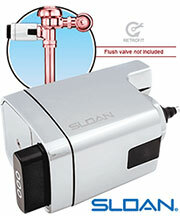 Item A1038A: Original Sloan part works perfectly. Sometimes difficult to determine which kit you need but when you have the right one it works correctly.